Dimensions 2.3" H x 1.8" W Accurate Temperature and Humidity Measurement Sensitive temperature and humidity sensor with high accuracy make the mini digital hygrometer thermometer be the optimal choice for both your life and work. The measurement every 10 seconds provides fast response and updated readings for you. User Friendly Feature This mini digital hygrometer thermometer is widely available for monitoring both indoor and outdoor humidity and temperature. This humidity gauge is compact for you to carry it outdoor so that you can adjust your arrangement in time. Three mounting options allow you display it on the wall with hanging hole, put it on a flat surface with support bracket or attach it on a fridge or other place with magnetic backing. Easy-to-read Display The large LCD screen simultaneously displays big digits of temperature and humidity, which makes it easy and clear for you to get the readouts even in far distance. What’s more, the fashionable black appearance makes it match all applied places. Specification Temperature Display Range: 32.0℉~122.0℉（0.0℃~50.0℃） Accuracy: when temperature is between 10.0° C~40.0° C, the accuracy is +/- 1.5° C, if out of this range the accuracy will be +/-5° C Temperature Graduation: 1.0℉/℃ Temperature Resolution: 0.1℉（0.1℃） Humidity Display Range: 20%-95%RH Accuracy: for humidity between 40%~80%, the accuracy is +/-5%, if out of this range the accuracy will be +/-7% Humidity Graduation: 1%RH Battery: LR44 Note Please replace the battery if the battery had run down after months. Please clean the product regularly and do not use it near water. Warranty Every product provides a 45-day money back guarantee and 18-month warranty. 【High Reliability & Accuracy】Fast response that measures every 10 seconds with 24 sensitive VENTS to provide updated and accurate readings, wide measuring range that measures temperature from 32.0℉ to 122.0℉（0.0℃~50.0℃), temperature accurancy range around ±2.7℉ ( ±1.5℃). Humidity sensor measures humidity from 20% to 95%, humidity accurancy range around ±5%. 【Comfort Level Indicator】Level icons indicate comfortable, un-comfortable and normal conditions. 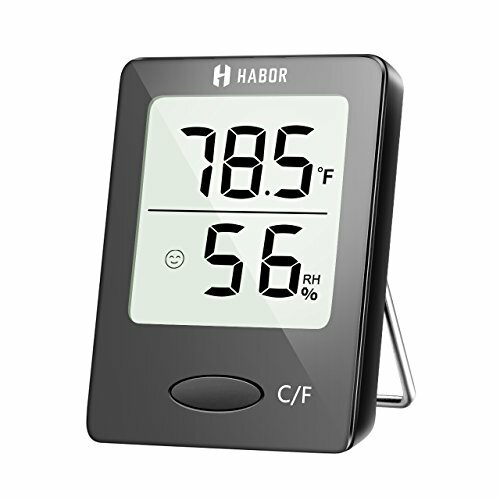 Habor hygrometer thermometer measures indoor humidity and indoor temperature in time help to adjust the humidifier, dehumidifier settings and humidistat, great for monitoring family's living conditions and health by preventing colds, dry skin, asthma, allergy, mold. 【Multiple Mounting Options】Habor humidity gauge room thermometer with magnet attaching, table standing, and wall hanging design, put anywhere you want, convenient mounting feature for every type of room like kitchen, garden, greenhouse, basement, baby room, guitar room and office.